Sometimes people talk about translites like they do about kleenex. Facial tissues are not all Kleenex brand, but we don’t stop to correct our language. We just blow our noses. Just about any picture that came from a camera and is printed as a backdrop will qualify to be called a translite. Okay, so we should include the “pictures taken without a camera” too. You know what I mean- wireframe and rendered scenes. So while we talk translites, let us focus our attention of the grand format vinyl prints. These vinyl backgrounds are used widely. The upside is great big panels with a lot fewer seams. Sometimes no seams. And they are sturdy and don’t damage easily. Years of use in some cases. Image quality is good. Color, when under control, is also good. And pricing can be less expensive. There is a downside. While the jury is still out, some people remind us that they don’t degrade in the landfills for a long time. And they smell like shower curtains when first made. So we can hope for a day when the substrate can be made better. For now, we offer vinyl backgrounds in either front lit or backlit versions. 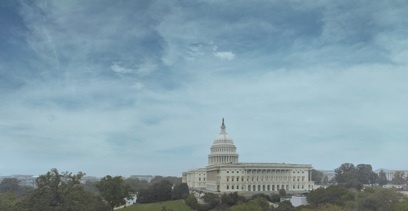 View of US Capitol Building from Congressional Office printed on Vinyl for Charlie Wilson’s War.